It's the story of a cat who loves his home and finds a new invader ruining it entirely. The new kitten, Mitzi, eats his food and sleeps on his blanket, it's all so unacceptable! So Bandit leaves and gets caught out in the rain! Poor thing! Who rescues him? Mitzi, of course! After that, Bandit isn't thrilled, but is a little more willing to share his things. Maybe the new kitten isn't all bad. I recently adopted a little kitten, and my older cat is not fond of her. 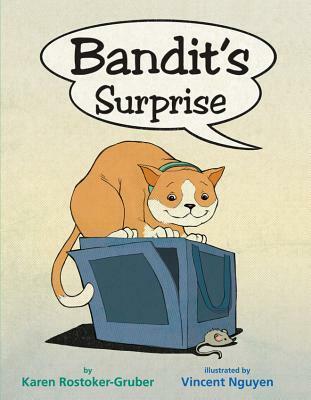 I felt like this book illustrated my home life perfectly, right down to the new kitten playing with the older cat's favorite furry mouse toy. The author and illustrator might as well have studied my house when writing and illustrating this book. In addition to it ringing true, it was a delightful read, with sweet illustrations.